An incision is made in the skin below the collarbone. This creates a “pocket” to hold the ICD. A lead (wire) is threaded through the incision into a vein in the upper chest. 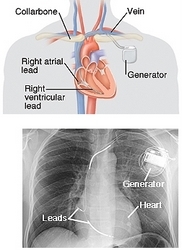 With the help of x -ray monitors, the lead is then guided into one of the heart’s chambers. Depending on how many leads your ICD has, this process may be repeated to guide leads into other chambers. The leads are attached to the heart muscle so they will stay in place. The generator (battery) is attached to the leads. Then the generator is placed in its pocket under the skin. A fast heart rhythm may be induced (started) to test the ICD. When everything else is done, the incision is closed with sutures, medical glue, or staples.